Praying mantids, spiders, predatory bugs and some other pet invertebrates eat other insects. The need food that is alive and moving, otherwise they will refuse to eat. The only appropriate live food for praying mantids and other invertebrates are bugs. Fish, mice, birds or food meant for humans are not fit to feed to your pet insects. Here you find a list with all insects that are fit for feeding to your pet insects. Most of these can be bought in pet shops or even caught in the wild. 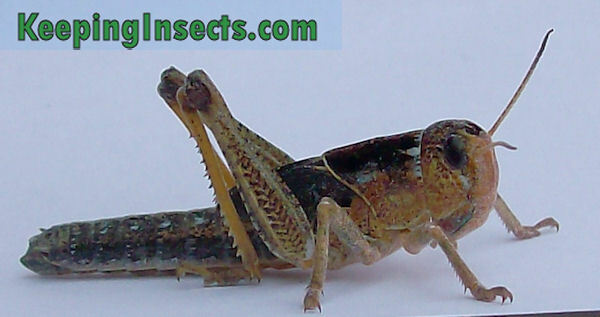 This is a large grasshopper that can be bought as adults or in various smaller nymph stages. There are different species of grasshopper that are bred for the live pet food industry and can be fed safely to your praying mantis or other pet. The most common are Locusta migratoria and Schistocerca gregaria. They are a good food source for many pet insects when making sure the grasshopper is not too big for the pet insect to grab and eat. Locusts do not make noise and are relatively odorless. They are able to chew through plastic netting (for example through mosquito nets). When escaped they cannot sustain themselves in your home. 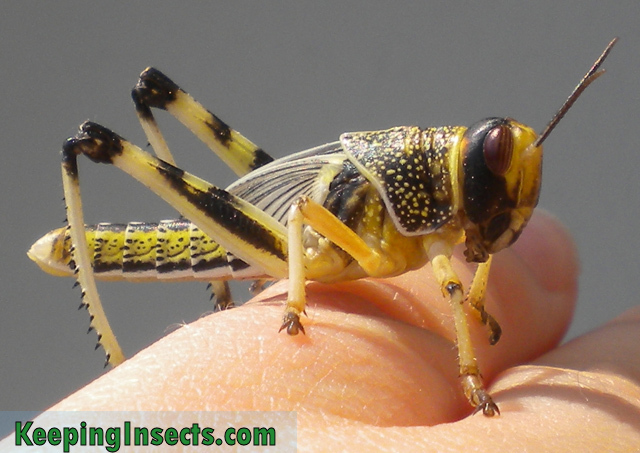 Locusts / grasshoppers can also be kept as pets, or be bred as healthy feeder insects. Read our page Grasshoppers as Pets to read more about them. Crickets are the most common feeder insect. They can be fed to many species of reptiles but also to almost all types of invertebrates. Some mantis species do not tolerate crickets as food, but most species do. There are many species of cricket that you can buy as feeder insect: the house cricket (Achetus domesticus), the field cricket (Gryllus campestris or Gryllus bimaculatus) and the banded cricket (Gryllus assimilis). They differ in size, color and temperature requirements, but they do not differ in quality as feeder insects. Crickets produce loud noises when adult, therefore feeding adult crickets can be really annoying. You can prevent noise by feeding only young crickets and by making sure none of them escape. Crickets can stay alive in your house for several months. Fruitflies are perfect food for small pet insects, especially for praying mantids. Praying mantis nymphs can live entirely off fruitflies! There are two species of fruit flies, each species can come either in flightless or flying variety. The small species of fruit fly is called Drosophila melanogaster. These are suitable for the smallest praying mantis nymphs. The big species of fruit fly, still a very small species of fly, is called Drosophila hydei. This species is suitable to feed to bigger nymphs or even adults of small praying mantis species. 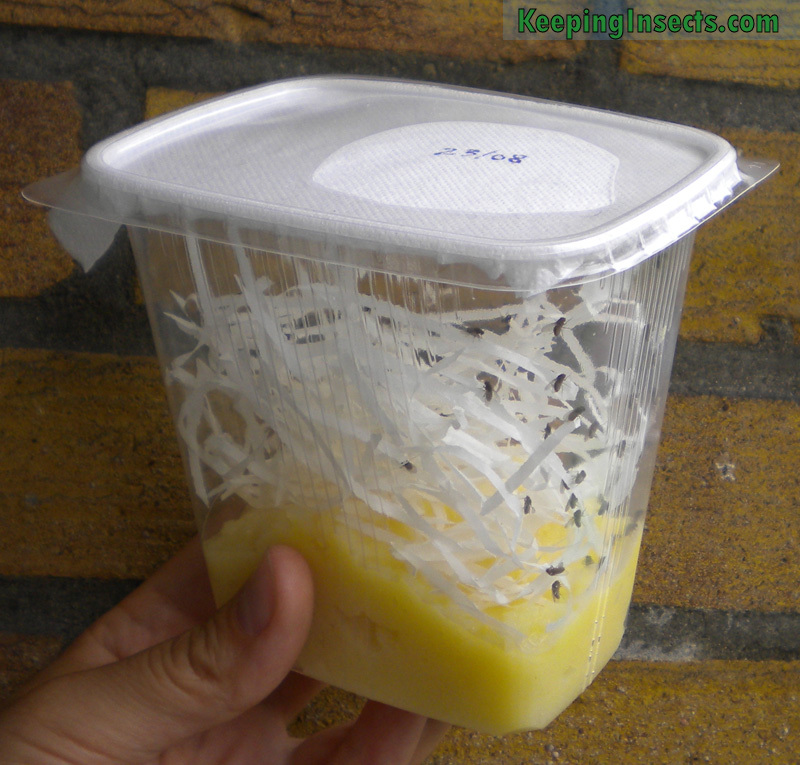 Fruitflies are bred in fruit fly medium and can be kept on this medium for a few weeks. Good fruit fly medium does not smell. Because you can buy flightless fruitflies, you don’t need to worry about starting a pest in your home. Flightless fruitflies do not become a pest in your home. Normal, flying, fruit flies do! If you want to breed your own fruit flies, you can read all about that at our Fruit Fly Breeding page. Flies are excellent food items for praying mantids. They can sustain themselves entirely on flies. Some species of praying mantis cannot be fed with other food than flying insects. 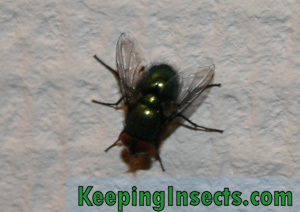 There are two species of flies commonly kept and sold; the blue bottle fly (Calliphora vomitoria) and the green bottle fly (this name refers to multiple shiny green species of flies like Lucilia sericata). These flies are able to fly. Flightless flies or curly wing flies (Musca domestica) can also be fed to pet insects, especially praying mantids. The benefit of feeding flies is that they are cheap and quickly noticed by your pet predatory insect. Therefore they will be quickly eaten. The downside of feeding flies is that they are not very substational, therefore you need to feed a lot to be able to sustain your pets (especially for big female praying mantids). Also escaped flies can be extremely annoying. Cockroaches can be good feeder insects to spiders and predatory bugs and they can also be fed to praying mantids. There are many species for sale, for example Blaptica dubia, red runners (Shelfordella tartara) or Death’s Head cockroach Blaberus craniifer. With cockroaches you have to make sure your pet insect catches the cockroach before it hides in the substrate or in other places of your pet housing. Once they have hidden themselves, they will often not be caught by your pet insects. Cockroaches can be easily bred and they do not smell or make noise. However, they can become pests in your house! Especially red runners can sustain themselves and even breed inside a home. 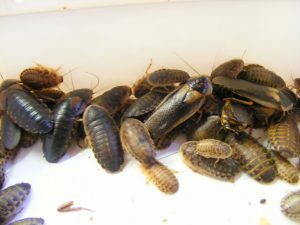 Dubia cockroaches are relatively safe to breed in your home, because they need high temperatures to breed. I would definitely think twice before bringing live cockroaches to my home! How to breed and keep cockroaches as pets or as feeder insects can be read here. Caterpillars and butterflies are good food for your pet insects, as long as they are not poisonous. You can recognize poisonous caterpillars by their bright colors. You can find caterpillars and butterflies outside in nature or you can buy them. The species that are for sale are usually caterpillars of silk moths (Bombyx mori) or the caterpillars of wax moths called wax worms (Galleria mellonella). Caterpillars are rather expensive to feed to your pet insects. They aslo contain a lot of water, making them less nutritious than they seem. I would consider them as ‘extra’ food but not as staple food for spiders and praying mantids. You can feed meal worms to your pet insects, however they are not staple food. They contain too much fat and not enough other substances to keep your pets healthy. There are two species of meal worms commonly used, the small meal worms and the big Morio or superworms. Both ‘worms’ are actually the larval stage of beetles. The small meal worm is of the species Tenebrio molitor, the big meal worm is from the species Zophobas morio. You can feed many other feeder insects too: katydids, spring tails, bean beetles, other non-toxic beetles, almost all species of flies and true bugs. It is better not to feed wasps, bees, spiders and of course toxic insects to your pet. Prey that is too big for your mantis can harm your mantis, either by struggeling or by turning the table and trying to eat your mantis (crickets can do this).